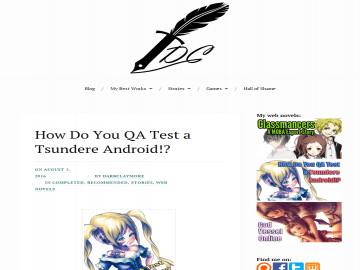 Muse's Success » Web Fiction Listings » How Do You QA Test a Tsundere Android!? "A guy who just graduated from university finds himself a job as a QA tester for... an unruly android girl!?" After finishing his first degree in Computer Science, Nick now searches for a job in the hi-tech industry. His attention is drawn to Anomalia, the company developing the most advanced androids in the world. Blessed with the curse of finding uncanny flaws in every product, Nick aims to become a “Quality Assurance” tester. It’s a safe job, where he can spend his time interacting with lifeless products and doesn’t have to worry about being socially inept. Little did he know, that becoming a QA tester in Anomalia will suddenly turn him into a father. Not to mention, his cheeky android daughter hates his guts... but also unconditionally loves him!? How Do You QA Test a Tsundere Android!? has not been reviewed yet. How Do You QA Test a Tsundere Android!? has not been recommended yet.